"In the school of the wilderness," Horace Kephart said, "there is no graduation day." To that I would add, "but the classes are always fascinating, sometimes exciting, and the homework is extensive." Every trip to the wilderness is like a class. You learn from observation, from experience, from introspection, and from the friends who are out there with you. Between "classes," you do the homework: finding answers to the questions posed by the last trip and preparing for the next one. In my case, this early May "class" had some difficult lessons. The McCormick Tract is a 17,000-acre wilderness area in Michigan's Upper Peninsula. It sits astride Marquette and Baraga counties, west of the village of Big Bay. It is comprised of rocky bluffs and irregular hills left by receding glaciers. 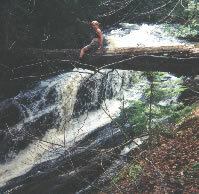 The Yellow Dog River runs through it, dropping sharply enough in places to create falls. There are numerous small lakes and wetlands. Last logged around 1910, the tract has some stands of sizable old timber. 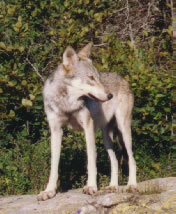 Hardwoods, pines, and hemlocks give way to cedars and other swamp plants in the lowest areas. The land was owned for three generations by descendents of Cyrus McCormick, inventor of the reaper. After infrequent use as a retreat, it was bequeathed to the U.S. Forest Service in 1969 by the last of his heirs. My trip from Flint to the rendezvous point was a bit roundabout as I first dropped my mother off to visit her sister in Iron Mountain. From there, I drove north on M-95, east across US-41, through Marquette, and then northwest on CR 550 before arriving in Big Bay. The countryside along much of this route was very scenic and I had to resist a strong temptation to explore some inviting spots along the way, like the banks of the Michigamme River and Marquette's Presque Isle Park. Upon arrival in Big Bay, I set up camp in Perkins Park near where we were to assemble the following morning. Mike U., another member of our group, showed up as I was getting organized. We decided to have dinner at the Lumberjack Bar. We then explored the harbor area and went up to the lighthouse to check out the carpet of wildflowers there. Neither of us could identify the small, pink-striped white flowers that covered the woodland floor and filled the air with their perfume. Fortunately, another member of our group, Gail, was exploring the area with her son. She thought the flowers were "spring beauty," an ID later confirmed with a wildflower text. Thursday morning, the entire group assembled at the Big Bay Cafe. 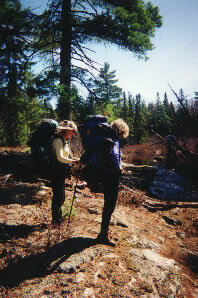 Besides Mike, Gail and myself, there was Jane, a newcomer to the group, and Michael, the trip leader. After a pancake breakfast, we loaded our packs into the two vehicles best equipped to handle back roads and headed out. The county had done considerable work in the previous week as Michael said some places had been nearly impassable due to flooding, fallen trees, and snow pack a few days earlier. After spotting one vehicle near the northwest corner of the tract, we parked the other near a trailhead a few miles away. We weighed our packs, admitted to excess, and pared them down as much as possible. While we were getting organized a couple of coyotes ran toward us from the woods, then veered off suddenly to the edge of the clearing, visibly startled by our presence. We began our hike following a trail that would intercept the Yellow Dog River below the falls, the plan being to work our way up river from there. Getting to the first falls was a relaxing walk and we spent the balance of the warm, sunny morning and early afternoon climbing upward. We discovered a succession of picturesque falls, played in the river at quieter spots, took pictures, listened to the roar of water over rock, and contemplated its power. Then, turning away from the river, we climbed an impressive knob of rock called the Crow's Nest. At the top, we ate lunch, enjoying awesome vistas in all directions. Lake Superior was visible more than twenty miles away. The hardwoods were just beginning to show signs of spring: maples had a haze of red flower buds and poplars were covered with new, chartreuse-colored leaves. These were interspersed with the contrasting dark green of pines. After lunch, we worked our way farther up the river, eventually deciding to camp on a bluff overlooking a wetland. The evening was punctuated by intermittent light showers. We explored the area, talked, and read before turning in. Awakening during the night, an almost full moon lit the marsh, creating a stark contrast with the dark forest beyond. The next morning we again followed the river, finding old hiking trails and remnants of bridges. By lunchtime, we had found another falls roaring through a clearing and we settled there to eat. The plan was to bushwhack to a proposed campsite on Lake Margaret after the meal. 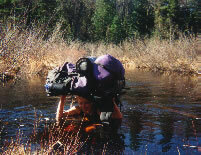 Following lunch and some relaxation, we packed up, skirted a small marsh, and set out on our calculated bearing. A little over 300 yards into this trek, with my eyes firmly fixed on the large pine at 194 degrees, I stepped over a small log and twisted slightly to disentangle myself from a small branch. There was a "pop" from my left knee and I found myself seated on the soggy grass with my left leg at a very odd angle. As this was not a comfortable position--to say the least--I scooted backward hastily. As the leg straightened, there was another "pop" and it felt much better. Mike, who was acting as slackman, gave me a hand to get up. As there was little residual pain, I figured I'd gotten lucky and everything was OK. I refocused on the pine and started out. Twenty feet farther along I was on the ground again. Lesson number one: don't take good health for granted--appreciate it because adverse events can happen at any time. Michael caught up to us and we discussed the problem, deciding it was some kind of dislocation. We elected to support the knee with an Ace bandage and drastically lighten my pack. Lesson number two: watching the others pick up part of my load brought home how interdependent people are in the wilderness--what happens to one person affects everybody. The interventions helped a little, but definitely didn't solve the problem. Stepping on my left leg was like trying to balance on two sticks held together in the middle by a weak rubber band. I started feeling shaky inside: there were miles between us and the cars. On the other hand, I didn't want to ruin the trip and argued for continuing to Lake Margaret since the planned route was a loose circle and we were approaching the farthest point. However, Michael vetoed this idea: "We're not going one step farther from the vehicles." We went back to the clearing by the falls, set up camp, and mulled over possible return routes. I apologized for messing up our plans. The others were very supportive. The remark that did the most to lift my depression was, "You haven't spoiled the trip; you've just made it a different adventure." That night, the sky was clear, the moon very bright, and the stars spectacular. In the morning, there was ice in our water bottles. 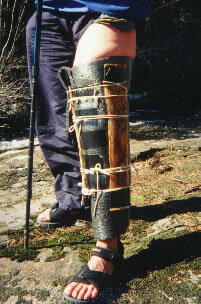 After breakfast, Michael improvised a splint for my knee using rope, a piece of my sleeping pad, two slats cut from a hollow stump, and of course, duct tape. It was as good as any commercial immobilizer. With a lighter pack, a trekking pole borrowed from Gail, and much vegetation to cling to, walking was possible--sort of. We decided not to just backtrack, but to head for the second vehicle via a more or less direct cross-country route, avoiding swamps as much as possible because my splinted leg caught repeatedly in the denser branches. I don't remember much of the countryside we crossed Saturday since I was very preoccupied with just staying upright. As evening approached, we found a grassy clearing that had been a beaver pond at some time. It made a pleasant campsite. Given time, the body adapts. By Sunday, I was becoming a bit more proficient at covering ground with the "peg leg." We headed for Lost Lake, arriving in the early afternoon. The area had once been a lumber camp and Michael immediately began to find old cans, broken bottles, saws, parts of a stove, and a rake imbedded in a tree. After lunch Mike took a nap while the rest of us decided to explore the area. We crossed a beaver dam and climbed Pinnacle Rock for more beautiful vistas--tree tops, distant blue-gray hills, and the Yellow Dog curving and dropping away below us. Time passes quickly when you're having fun. Packing up Monday morning, it didn't seem like it could be the last day of the trip already. We had only about 1300 meters to go. Mike and Jane would do the navigation, taking turns counting paces and walking the bearings they had calculated. They did an excellent job; we came out on the road within sight of Mike's truck. Travel through the hardwoods was relatively easy and I spent some time mulling over what I had learned--that we are only as strong as our weakest point. I made a mental list of questions to be answered. What were the white tubular flowers by the first falls and the pink ones that looked like miniature rhododendron? What was the conical creature I saw in the stream on the second day? How can I get my pack weight down? Is there a way to fix this knee for future trips? I would definitely be busy with this "homework" until the next "class."